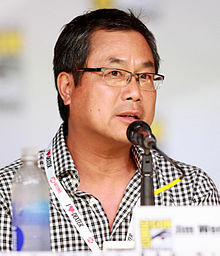 James Wong (born April 20, 1959) is a Hong Kong-born American television producer, writer, and film director. He directed and wrote episodes of The X-Files and Millennium and has written episodes for American Horror Story. He is the co-creator and co-writer, along with Glen Morgan of Space: Above and Beyond. He is also the founder of Hard Eight Pictures. In film he has directed Final Destination, Final Destination 3, The One, and the remakes of Willard, Dragonball Evolution, and Black Christmas, along with writing partner Glen Morgan. Wong was born in Hong Kong. At age ten, he moved to the United States along with his family, settling in San Diego, California. During his youth, he met his future writing partner Glen Morgan at El Cajon Valley High School. Later on, he went to Loyola Marymount University, joining a comedy improvisational group. Originally seeking a major in engineering, he later switched to a film major after seeing Apocalypse Now at the Cinerama Dome. After graduating, he landed a job as an assistant to Sandy Howard. During this time, both Wong and Morgan wrote screenplays, eventually having one produced. With Morgan, he co-wrote The Boys Next Door. After this Wong became a story editor on the short-lived ABC crime drama Knightwatch. Later, with Morgan, Wong would work on many Stephen J. Cannell productions, including Wiseguy (as supervising producer), The Commish (as supervising producer), and as a staff writer and story editor for 21 Jump Street and its spinoff, Booker. Wong and Morgan began working with Chris Carter on the science fiction/drama The X-Files, about two FBI agents investigating the paranormal, filmed in Vancouver. In 1995, Wong and Morgan were offered an $8 million, four-year contract deal with 20th Century Fox Television to write and produce television series. As part of this deal, Morgan and Wong went on to create the short-lived series Space: Above and Beyond. They returned to The X-Files briefly in its fourth season (1996–1997) when they wrote the horror episode "Home." Wong also made his television directing debut with the conspiracy-themed "Musings of a Cigarette Smoking Man," written by Morgan. Wong and Morgan also took on production and writing duties for Carter's Millennium. Later, they would go on to executive produce the short-lived NBC paranormal series The Others. During 1995, both Wong and Morgan were hired by producer Joel Silver to write the third intended Tales from the Crypt movie called Body Count. Their script was loved by executive producers Silver, Richard Donner, Walter Hill, David Giler and Robert Zemeckis but the main producers Gilbert Adler and A L Katz hated it and Universal thought it would be too expensive to shoot. In 2000, Wong directed Final Destination, a film he co-wrote with Glen Morgan. Wong followed the directorial debut with The One (2001), an action film starring Jet Li, and with more horror films, including Willard (2003), directed by Glen Morgan and starring Crispin Glover, and a second sequel, Final Destination 3 (2006), directed by Wong. In late 2006, Wong and Morgan's remake of Black Christmas was released; the script was by Wong and Morgan and the film was directed by Morgan. In 2009, Wong directed the live-action movie adaptation of the Anime and Manga media franchise Dragon Ball but was poorly received by both critics and audiences alike. Since 2011, Wong has been working with Ryan Murphy as an executive producer on American Horror Story. In 2015, Wong wrote and directed one episode, Founder's Mutation, for the tenth season of The X-Files. He returned again in 2017 for The X-Files season eleven to write and direct the episode Ghouli, and to direct the episode Nothing Lasts Forever. James Wong is married to Teena Wong. ^ "Hard Eight Pictures, Production Company". ProductionBeast. ^ Petski, Denise; Petski, Denise (September 10, 2015). "'American Horror Story: Hotel' First Trailer – Meet The Residents". Deadline. Retrieved January 16, 2019. ^ Miller, Liz Shannon; Miller, Liz Shannon (January 26, 2016). "Review: 'The X-Files' Season 10 Episode 2 'Founder's Mutation' Reminds Us What We've Been Missing". IndieWire. Retrieved January 16, 2019. ^ Fowler, Matt (January 31, 2018). "The X-Files: "Ghouli" Review". IGN. Retrieved January 16, 2019. ^ Handlen, Zack. "A gory X-Files offers up a new kind of vampire". The A.V. Club. Retrieved January 16, 2019. ^ Chris Carter Talks About Passing “The X-Files” Colonization Date (2012); Reveals Returning Cast! ^ The X-Files first season episode's Eve character of Teena Simmons/Eve 9, was named after her.